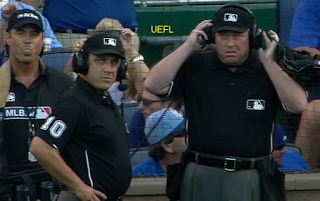 A Pirates' fly ball bouncing off and over the outfield wall in Kansas City produced a rule-book double upon a Crew Chief review, effectively overturning the umpires' original on-field ruling of a home run. With replays clearly showing Starling Marte's drive hitting high off the fence in left field before kicking in the air and landing beyond the wall, all while in fair territory, Pittsburgh Manager Clint Hurdle was left wondering how such a high-flying hit could be declared anything but a homer, especially after ruled a home run on the field by 3B Umpire Phil Cuzzi and crew chief Gerry Davis. Official Baseball Rule 6.09 (2015 OBR 5.05(a)(5)) states that a batter shall have hit a home run and be entitled to touch all four bases when, "A fair ball passes over a fence or into the stands at a distance from home base of 250 feet or more." Oddly enough, the rule governing a fair ball passing over the fence at this distance greater than 250' fails to include the term "fly ball," but the phrase makes an appearance just one sentence later, in regards to the no-longer existing short dimension: "A fair fly ball that passes out of the playing field at a point less than 250 feet from home base shall entitle the batter to advance to second base only." Regardless, the rule regarding a home run pertains specifically to a "fair fly ball," and moreso we're looking for a fair fly ball that passes over top of the wall. Replays clearly indicate the ball hit the wall several feet below its top (since, at Kauffman Stadium, the railing/chain-link portion in front of fans is considered part of the outfield wall [we thought MLB might want to shift Kauffman away from the Universal Ground Rules following that particular 2011 play, but...they didn't]), meaning that we essentially have a ball hitting mid-wall, and caroming off that at a height that enabled it to bounce out of the playing field. ground rules has once again caused confusion. Subsequent provision (8) governs, "Any bounding fair ball is deflected by the fielder into the stands, or over or under a fence on fair or foul territory, in which case the batter and all runners shall be entitled to advance two bases." Yet we also know, pursuant to provision (9), that "Any fair fly ball is deflected by the fielder into the stands, or over the fence into foul territory, in which case the batter shall be entitled to advance to second base; but if deflected into the stands or over the fence in fair territory, the batter shall be entitled to a home run." So at this point, our key distinction is "bounding fair ball" versus "fair fly ball," or simply "bounding" vs "fly." 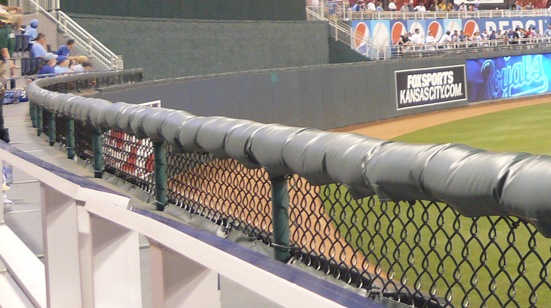 Bounding: A bounding ball is one that has bounced (and specifically bounced off of the ground, wall, or any other object which is not a defensive player); we see the term "bounded" in two places within the rules: Regarding fair/foul status on a batted ball passing first or third base, and regarding a fair ball entering the stands. A ball is said to be "bounding to the outfield" if it has been batted, and more practically, if it has touched the ground prior to the front edge of first/third base. A ball is bounding over the wall, similarly, if it has touched the playing field in some way prior to leaving it. Fly: A ball is on the fly as long as it has not been touched (e.g., catching a ball "on the fly" for an air out). In the case of passing first/third base for determining fair/foul, in stark contrast to a bounding ball, a fly ball is not adjudged to be fair/foul until it is no longer a fly - until it has touched something, or more overtly, has changed direction from its natural descent. Usage: Sacrifice fly, infield fly, etc. Deflected: To cover all of our bases, a deflected ball is one whose trajectory has changed by virtue of a player touching the ball - whether after being a bounding ball or a fly ball. Usage: As in (9), a defensive player deflecting a fly ball over the fence in fair territory results in a home run. As you can see, bounding and fly are mutually exclusive and, generally speaking, a fly ball could precede a bounding ball on the same play, but a bounding ball will not precede a fly ball. Replays of the Pirates non-HR indicate the fair fly ball struck the outfield wall in left field, at which point the fly ball became a bounding ball. The now-bounding ball caromed high in the air before falling on the out-of-play side of the fence in left (also in fair territory). Because a bounding ball exited the playing field, as opposed to a fly ball in flight, Rule 6.09 (2015 OBR 5.05(a)(8)) took effect (as opposed to, say 5.05(a)(5)), meaning the batter was awarded two bases for the bounding ball exiting the playing field.